Just added to the Crochet Spot Store, My Fatty Handbag is a fun yet classy purse that is easy to crochet! The body has a gathered design making the bag seem compact when in reality it’s fat and spacious to carry around all your goodies. To download this pattern, log into the Crochet Spot Store. By purchasing this pattern or becoming a Premium Pattern Member, you will be supporting Crochet Spot! If you are a monthly Premium Pattern Member, simply log into your store account and download this pattern for free! Your monthly membership fee is helping to support Crochet Spot and is greatly appreciated. If you’re not a member, you may become one, or purchase this pattern individually. 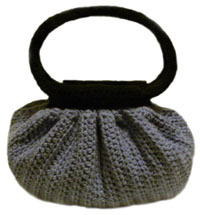 If you need any help while crocheting My Fatty Handbag, just let me know and I’ll be glad to help you out! 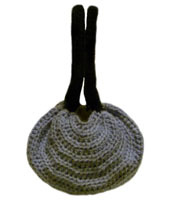 This entry was posted on Saturday, March 27th, 2010 at 4:13 AM by Rachel Choi	and is filed under Best Crochet Patterns. You can follow any responses to this entry through the RSS 2.0 feed. You can leave a response, or trackback from your own site. Sweet, I just bought mine, can’t wait to get strated. It looks really, really easy to crochet. Thanks Rachel for including soo many pics! OMG i LOVE this bag!!! Super cute bag! Are the handles crocheted as well or are they the handles you buy at a craft store? Hi Jade, the handles are crocheted as well. But they can be replaced with the kind you buy at a craft store if you desire. Got my pattern-Love this bag!! Could the body of the bag be crocheted bigger and the handles longer for a shoulder bag? If so -how would you do that? Hi Pamela, there are instructions for making the handles longer within the pattern. The size of the bag is more tricky to change, but you can try and use a heavier weight yarn and a larger crochet hook. This bag was so easy to crochet and SO cute too!!! But I was wondering how I can make a liner for it in the same shape as the purse? Hey Kim, try and lay the finished bag as flat as possible and then trace it to make a template for your liner, then add an inch or so for the sewing. Hi Emily, the whole bag should be slouchy when you’re done, including the bottom. If you want your bottom to be stiffer, how about putting a piece of cardboard or a magazine inside the bag on the bottom. There are also some purse bottoms or organizers you can buy at stores (I’m not sure exactly what they’re called though).